I've been to Vermont for skiing and ice climbing but never for fishing. It's no further than the Adirondaks for me but I just always felt the 'Daks were more accessible due to the abundance of public land. Motivated by my lack of success west of Lake Champlain this year I decided to try my luck in the Granite State. Despite the sleet, snow, rain and hail I ended up having one of my better days of fishing. I caught 9 or ten trout, which is already a good day for me, but I also caught the first one in the within 15 minutes from the start. That always sets up the rest of the day nicely. The weather was miserable, I had several scary slips and I lost my sunglasses but the fall colours were beautiful and the fish were bitin'! 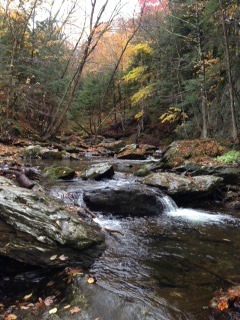 I fished the tributaries to the Lamoille river, and access was easy. I didn't see another angler; everyone gone moose hunting I guess. Eastern fishing can be pretty darn good after all. 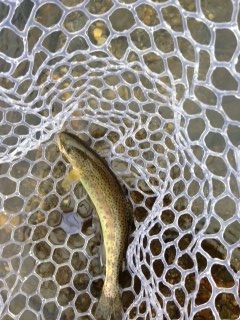 They were all Rainbows with the exception of one small (fingerling) brown. #14-16 Pheasant tail worked well but the UKB was better. No luck with the copper john at all. That looks like a perfect little stream. The more I see of New England, the nicer it looks. Plus, you guys are getting the cold weather that's being sorely missed here in Montana. I heard Black Dike got climbed last week. If you ever make it out here to Hyalite, be sure to carry some fishing gear for those rest days. I will remember my fishing rod if I ever make it your way! There's a nice write up on the Black Dyke ascent on neice.com.